Vintage - W.H. 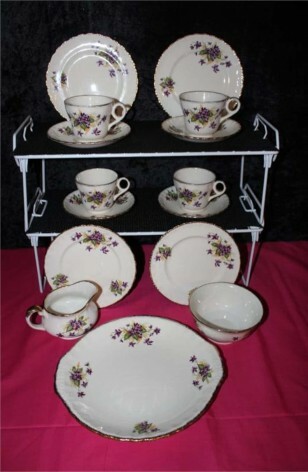 Grindley & Co. China - "Cream Petal Violets" Pattern - Made from 1954 through 1960 only - Total of (15) Pieces. This Vintage Grindley & Co. Tea Set, in the Cream Petal Purple Violet Pattern, is offering a Service for Four. Violet Bouquets are on all pieces of this Lustrous White China. All Pieces are Rimmed in beautiful 22k Gold Gilt. Colors on this Pattern are Purple, Yellow and Green. Plates are Scalloped. If you love shades of Purple, this is the Tea Set for you. 4 - Bread/Dessert/Tea Plates - 6 3/4"